Camp Little Jaguar is a luxury adventure camp located at Kanatal, is tucked away in the midst of deep forests of oaks. 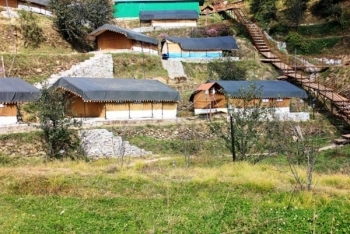 Camp Little Jaguar is one of the best camping site which is located at Thangdhar village (near Kanatal). Kanatal is a chilliest & highest offbeat destination near to national capital Delhi. The camps have a good supply of electricity with an adequate back up facility as well. Apart from the beautiful location, Campsite consists a large play ground area in which anyone whether a child or an adult can enjoy a number of activities. Camp Little Jaguar is located near Dhanaulti on Chamba-Mussorie Higway, just 300 kms from Delhi, 100 kms from Haridwar, 42 kms from Mussorie hill station, 14k kms from Dhanaulti/Chamba, 75 kms from Rishikesh/Dehradun. Kanatal Jaguar Camps offers 16 Luxury camps with attached bathrooms (hot and cold running water throughout the season). There is a separate and spacious tents for buffet dining. Full course vegetarian and non-vegetarian buffet meals are served. Delicious and multi cuisine dishes like Indian, Tandoori are prepared by trained chefs. Food served at Camp Carnival is absolutely yummy and hygienically prepared. - Team Building Activities: Depends on Group strength. - Indoor Games: Card, Chess, Tambola and Carom etc. - Bonfire: Bone Fire with light music. - On Request and Extra cost: DJ and Bar-B- Que. All meals: Breakfast, Lunch, Dinner, Evening Tea/Coffee with Veg. Snacks (stay in luxury Jaguar Swiss tents). 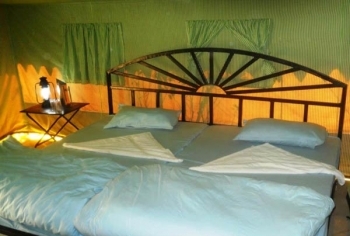 Accommodation: Stay in Camps in the lap of nature with a Natural touch. Trekking: A must to do thing to make your trip memorable, Surkanda Devi Trek: Surkanda Devi is an ancient shrine located near Dhanaulti dedicated to Sati - Wife of Lord Shiva. This sacred temple is set at an astounding altitude of 3030mts above sea level.The trek affords panoramic views of snow clad peaks of the splendid Himalayan range. Bonfire: Bone Fire with light music. On Request and Extra cost: DJ and Bar-B- Que. Note: Activies depends on wether Caondition. - Kids below five years Complimentary. - Kids Above chargable 50% of the package. - Above 12 will be charged as adult. By Flight: Jolly grant in Dehradun is the closest Airport, just 92 kms from Kanatal. By Train: Dehradun, Haridwar and Rishikesh are the closest railway station. Rishikesh is 76 kms and Dehradun is 86 Kms local taxies and Govt Buses are easily available for Kanatal. By Road: Kanatal is easily reachable with Mussoorie and Chamba from ISBT kashmiri Gate buses provides daily services for both places. You can also take taxi and cabs from Delhi NCR, Haridwar, Rishikesh and Dehardun to reach Camp Little Jaguar in Kanatal.